Desmond Haymon's improbably four-point play with 3.6 seconds in regulation sent the game into OT. The NCAA tournament has a new darling after one of the most improbable finishes in the NCAA tournament’s long bracket-busting history. Pulling off a comeback for the ages, feisty Stephen F. Austin became the latest No. 12 seed to pull off an upset, tying the game on Desmond Haymon’s did-that-just-happen four-point play with 3.6 seconds left, and then holding on in overtime for a 77-75 win over Virginia Commonwealth on Friday night. 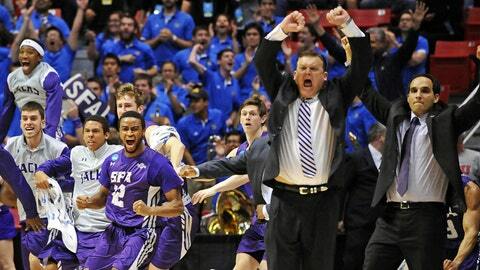 "Well, miracles truly do happen," SFA coach Brad Underwood said. It’s been a wild ride in the NCAA tournament already, a two-day run filled with upsets, buzzer-beaters and millions of crumpled brackets across the country. SFA’s victory marked the fifth overtime game during the round of 64, a tournament record. SFA didn’t have the biggest upset of the opening two rounds — Mercer probably gets the nod there with its win over Duke — but the Lumberjacks certainly had the most jaw-dropping finish. The Lumberjacks worked the ball around to the wing, where Haymon launched a 3-pointer and was fouled by JaQuan Lewis just before the ball fell through the basket. The crowd still buzzing, VCU coach Shaka Smart called timeout trying to ice Haymon, but the senior calmly knocked the free throw down. "I was struggling shooting the ball and I knew to get it going, I was going to have to continue to try to find it (his touch)," Haymon said. "I guess I found that groove with the last shot." VCU’s turn at glory came after SFA’s Thomas Walkup made 1 of 2 free throws put the Lumberjacks up 2 with 14 seconds left. The Rams got a good look on the final possession, working the ball around to Lewis for an open 3-pointer on the wing. Jacob Parker scored 22 points and Haymon had 17 for SFA, which moves into Sunday’s third-round game against the Tulsa-UCLA winner. "Honestly, I thought we had it," Burgess said. "We had them on the ropes, but they came back and made some tough shots and important shots to win the game." SFA certainly had qualifications to be this year’s darling: A fun-loving group of players led by a long-haired shooter they call Sunshine, a frenetic style — at least when it comes to half-court defense — and the nation’s second-longest winning streak at 29. Oh, yeah, VCU has that defense, too. It’s called Havoc and it has created more turnovers and steals than any other team in the country the past two seasons. SFA plays a little D of its own — more of the half-court variety than the Rams — so naturally tipped passes, floor burns and scraps for loose balls filled the arena when they met on the court for the first time. The Lumberjacks picked their way through the havoc with pinpoint passing on backdoor cuts and the interior, taking a six-point lead into halftime on Parker’s last-second 3-pointer. VCU made the game more chaotic — Havotic? — with its pressure to start the second half and started working the ball inside, racing through an 11-0 run to go up 52-43. The Rams stayed in control most of the half, but missed four free throws in the final 32 seconds to give the Lumberjacks a shot at victory. "I like the way we battled the majority of the second half, but we just didn’t finish the game," Smart said. "We kind of gave them a glimmer of hope." The Jacks ran with it, earning their spot in NCAA tournament history with one improbable shot.